Luxurious silky cream delivers all-day hydration to thirsty skin, while shielding it from the dehydrating effects of daily thermic shocks that leave it looking dry and weathered: sun, sudden temperature changes, indoor and outdoor pollutants and environmental stress. Quenches skin with Organic leaf of life extract—a succulent plant that enhances the skin’s ability to retain precious moisture—leaving it comfortable, radiant and perfectly hydrated. Rated 1 out of 5 by gabii from Not happy! Please bring HydraQuench back. It’s very fustrating that Clarins constantly changes their products when a costumer gets used to a product. I personally have purchased Clarins for over 5 years but I defineatly think it’s time to find new products other then Clarins. I have a full box of very expensive products, not even have way empty, that have had the need to change for the fact that it feels like you’re constantly testing out the products and dont end up working out, so you need to buy a new one. They always renew their formulas, so don’t get use to one product, because it is most likely they will change it and the new won’t always work out as good as the one you initially liked. What a bummer! I absolutely used to love Clarins and even recommended many friends and family, which they as well are fed up with all this changes. So Clarins has defineatly lost many buyers. At least 6 of us that I know where frequent buyers. Rated 5 out of 5 by LightBear from First time trying this particular product I LOVE IT! 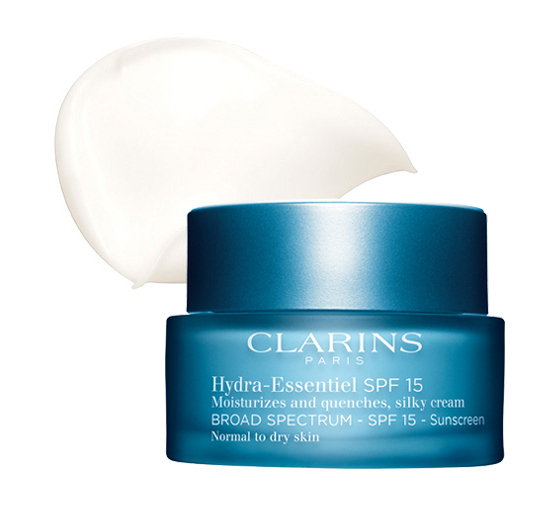 I normally use the Super Restorative Day Cream and decided to try the Hydra Essential Cream SPF 15, and I have fallen in LOVE! Rated 4 out of 5 by Experiment from Consider It is good product, smell good but take time for your skin to absorb. Its very light for skin and feel good. Rated 5 out of 5 by Jancee from CALMING AND SILKY This cream is lovely. Just dipping into it to put on your face is touching quality that is not greasy nor shiny. It hydrates. Period. Rated 3 out of 5 by selpmid from Still on trial mode Prior to using this moisturizer, I was using Bright Plus HP Brightening Hydrating day lotion SPF 20 then it was discontinued I move to Hydraquench. The Hydraquench + Energy booster are perfect (I still have not moved on why they discontinued the bright plus line). I ran out of the hydraquench and went to the nearest Sephora store only to find out that the hydraquench was replaced by the Hydra-essential line. It has been almost a month since I started using it. This new cream is a bit thick and takes awhile to be absorbed by my skin. I don’t want to throw it away as it is a bit expensive and I wanted to try the silky cream version. Plus when I use the Booster + Double serum + this moisturizer, my face feels so heavy. I mean it does the job, the texture is what I don’t like. Maybe I should not try it with the double serum. I have not tried the Booster + moisturizer yet, if I do I will probably write another review on how it feels. I am not sure if I like this type but I like a lot of Clarins product so I am going to finish this bottle and not throw it away. Rated 1 out of 5 by LadyHawkexx from Not happy I have used HydraQuench for years, and received a sample of this product. It made my skin too slick, so that makeup won't stay on. I fail to understand why Clarins continues to try and discontinue HydraQuench when it is the best mosterizer I have ever used. Please bring it back! Rated 5 out of 5 by LisaJ from Love this new moisturizer! Nourishes my combination skin in this dry winter season. Rated 5 out of 5 by Anonymous from Soft and silky I received a sample for testing purposes and was very pleased! I have combination skin and this soothed dry areas without making my oil slicks worse. I'm sold! Day after day, the dehydrating effects of heat, cold, pollution, sudden shifts in temperature and humidity can leave skin looking dry and weathered. Water is essential to life, and to your skin’s beauty and comfort. 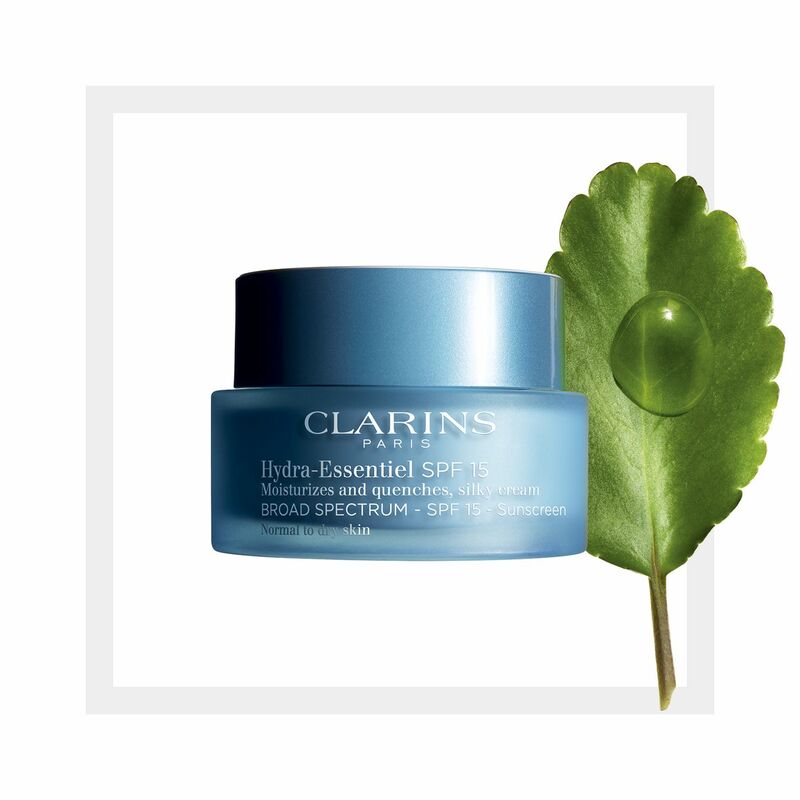 Now, NEW Hydra-Essentiel Silky Cream Broad Spectrum SPF 15 delivers all-day hydration, while decreasing risk of early skin aging from harmful UVA/UVB rays.